New York Times bestselling author Shannon Hale won a Newbery Honor for THE PRINCESS ACADEMY; she's written novels for adults (one of which was adapted for the big screen); and with her husband, has written graphic novels. In all, she's written 20 books. She does everything, and does it well, and we are incredibly lucky to have her on the faculty of the SCBWI summer conference in Los Angeles, where she is giving a keynote and leading an intensive on world building in fantasy. >> Registration for the conference is open, and there are still spots for Shannon's intensive. In addition to all of her exceptional books, Shannon has been at the forefront of discussion on gender equity when it comes to authors. She has a way of bringing up these issues that is clear, passionate, and perspective-broadening. Her post about being a woman author and school visits is a must-read. 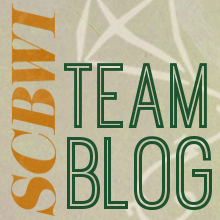 On behalf of Team Blog, I asked her a few questions to get us excited for her presence at the conference. Did you ever expect to become a spokeswoman for feminist issues in reading? Why do you feel called to do this? I've always thought about gender issues. I have memories from kindergarten, noticing that boys got different treatment, that girls were considered lesser. In junior high, with my allowance money I bought a sign that said, "God created man before woman. You always make a rough draft before the final masterpiece." I hung it in my locker at school. Boys made fun of me for it. I was trying to declare something with that sign, but I didn't know what. The idea that girls were lesser haunted me. I felt certain it wasn't true at times, and other times not so certain at all. I noticed and cataloged the portrayal of girls vs boys in books, movies, the assumptions teachers and parents and peers made about people based on their gender. I think I assumed everyone else in the world was also interested in gender issues. I started blogging in 2002. Gender issues naturally came up on my blog, because it's something I think about so often. I did a yearly count of female:male speaking roles in animated movies. Spoke up about "boys will be boys" mentalities. Wrote about being marginalized as a woman writer. Overhearing my neighbor tell her daughter that when boys hit and pushed her, "that just means they like you." Lack of representation. The number of times interviewers have asked me, "Why do you write strong female characters?" and how I've never been asked, "Why do you write strong male characters?" Stuff like that. And I was surprised by how many of my blog readers commented, "I've never thought about these things before. I've never noticed." I don't think I'm a spokesperson for anything. But I have started making an effort to point out gender bias when I see it, because I do see it, and I know now that not everyone does. And it's so important. So important. If I make one change in the world, I hope it's getting more people to question why boys are shamed for/kept away from reading books about girls. The more we question the idea that it's normal and natural and fine, the more we'll realize it's not and things will slowly start to change. You're offering an intensive on world building. What's your favorite bit of world building from your books? I loved creating the world in BOOK OF A THOUSAND DAYS. I did fascinating research on Mongolia and the era of Genghis Khan and then got to build a world from the ground up: history, language, geography, culture, religion. Every detail in the world of that book was essential for the story I told, and that was very satisfying. What the heck does Squeetus (the title of her website) mean? My husband made it up. It's the formal version of one of his many nicknames for me. Squeeter Pig is a more informal version; also Piggie. Mostly it's just fun to say. A definite fantasy scenario is having one of your favorite authors read your manuscript and like it enough to blurb it. The chances against such a thing happening are pretty huge for many reasons, not the least of which is that authors are busy with work of their own. But my editor, Arthur A. Levine at Scholastic, has taken special care with The Game of Love and Death. The result is something I wouldn't have dared dream of. A long list of some of my very favorite authors not only took the time to read my book, they liked it. I've been having a Sally Field of a time processing it. I've linked to each of these authors' sites, so do check them out if you haven't read their work. It's an incredible slate of writers—so great I've been almost too embarrassed to say anything. — Nancy Werlin, New York Times best-selling author of IMPOSSIBLE. THE GAME OF LOVE AND DEATH weaves a complex tapestry of love and longing, destiny and hope. Daringly conceived and brilliantly executed, it is not only an intimately human story, but one that encompasses the very nature of love and death. Rich, wise, and deeply satisfying—the story will linger in your heart long after you’ve turned the final page. Have you registered yet for the SCBWI mid-winter conference in New York City? It's coming right up (Feb. 6-8), and one thing that sets this conference apart is the rare opportunity for you to participate in a writers' roundtable, receiving feedback on your work from an agent or editor. I'll be moderating this event, and I've also participated as an attendee, so I thought I'd tell you what these are like—both so you can feel more relaxed going into it, but also so you can be ready to get the most possible benefit. As the name implies, you'll be sitting at a round table with a group of other writers and a faculty member (typically an editor or an agent). There will be two sessions that day, so everyone can either read the same manuscript excerpt twice, or can get feedback on two pieces. Your best opening, ideally to a completed work. And do make sure you've read it out loud to yourself for practice. You'll catch hidden typos and hear awkward word repetitions. Because so many people are reading out loud at once, the room gets noisy. So, be prepared for that. Once you've read your work, the faculty member will give you feedback. The point of this is to help you take your writing to the next level. So, listen and take notes. Then thank everyone for their thoughts. It can be tempting to explain what you were trying to do when you feel your work has been misunderstood. Resist the urge! You don't want to waste time that could be spent absorbing wisdom this way. And the hard truth is, if you have to explain something about your writing, what you did isn't working. This is the primary benefit of these round tables: hearing a professional reaction to your writing. Only in rare cases does the agent or editor request the work. This can happen; it happened to me, and the novel I brought to New York three or four years ago, THE GAME OF LOVE AND DEATH, will be published by Scholastic next spring. But guess what? It's not being published by the editor who requested it. She's not even an editor any more, so even if I'd thought the roundtable was my big break, it wasn't. Coming May 1, 2016 from Arthur A. Levine Books, an imprint of Scholastic. So, if you let go of the hope that this will be your big break, and think of it as an important investment in your education as a writer, you'll be in great shape. The second key benefit of these writers' roundtables: You'll also get to hear feedback about other people's writing, and in the same way, learn how it strikes people who really know what they're doing. So, pay close attention and you'll learn a great deal. This, by the way, is why it's important to bring your best work, and not something you just dashed off the day before (people do this, believe it or not). When you've put everything you can on the page, you've done your best work. When someone shows you how it can become better, and you take that advice to heart, you will rise to a new level of skill. And this is how you get published—you just keep breaking through your old plateaus until your work is as good or better than what's already on the shelves. The third benefit of these experiences might be the most important: the relationships you make with other writers at your table. It's not at all unusual to form lasting friendships this way, or to find people willing to swap pages with. This is a hugely important aspect to becoming a writer: cultivating a mutually supportive community. What's more, I'm working again on the book she asked about, and I know I can count on her for meaningful feedback when I'm ready. Even though she lives on the East Coast and I live on the West Coast, we can support each other in our work, a relationship that never would have happened had we not both taken the big step of our first roundtable critique session. I hope to see you in New York in the next couple of months! Ooh! Look at all these books! An ARC of THE GAME OF LOVE AND DEATH could be yours, along with seven other advance copies of some of the most highly anticipated YA novels of 2015 PLUS a special holiday bonus, the smashing UK edition of MY TRUE LOVE GAVE TO ME. Some of the books will even be *signed* by the authors! To enter, please visit Lisa Schroeder's blog, which has a Rafflecopter link. It's hard to imagine a writer with more influence over young readers than Judy Blume. It's not just that her voice is true and appealing. It's also that she writes about the things kids hunger for (which is probably why she is often in the sights of book censors). More than 80 million copies of her books have been sold, and they're available in more than 32 languages, making her beloved around the world. You probably have your own Judy Blume moment: that time you found yourself inside the safety of a book with characters experiencing exactly the things you feared, struggled with, or wondered about. Mine came when I read the book DEENIE during a swim meet when I was in sixth grade. A friend had lent it to me, because that is the way of Judy Blume books. They are passed hand to hand, as secrets are from mouth to ear. I read it straight through in the hot, chlorinated air of that swimming pool, lying on my damp towel as I waited for my events to be called. And as it is with the books we loved when we were young, that one twisted itself into my DNA and lives there still. When I see things that remind me of those characters and their struggles, when I smell a hot blast of chlorine, back I go into that story. I'm not that same kid anymore, and so the story isn't the same story. It's better, and this is the genius of Judy Blume. Judy is a big supporter of the children's writing community and serves on the SCBWI board of advisors. What's more, a fellow SCBWI member, the unstoppable Debbie Ridpath Ohi, illustrated a brilliant new series of covers for her classic books. Judy will be at the sold-out SCBWI conference in Los Angeles next month, and even though she is on a book deadline (with her adult novel coming out next year), she took the time to answer a few questions for us. Did you ever have a moment in your career when you thought you'd never get the hang of it? Not so much in the beginning because I didn't know anything—as now, when I know too much. And in between I've had a lot of moments when I wanted to quit. How did you move past that? Don't over think it and just let it come. If it doesn't come today it will come tomorrow. Sometimes I just have to take long breaks between books. What's the best piece of writing advice you ever got? From my daughter, this week. (I'm having a hard time with revisions due the end of summer). "Mother, just get up every morning, sit at your desk and write down anything and everything and it will come." And that's exactly what I'm doing. Sometimes, even when you know what to do, it helps to hear it again. Every woman my age I know (including me) credits you with helping us navigate adolescence. Are there any authors who did that for you? There were no YA book when I was a teen. I was reading from my parents' bookshelves at 13. Those books may not have helped me navigate adolescence but I learned a lot about life from them.